It's a tricky creative brief. Why would I talk about this idea? How can I get involved in this idea? The boys here had a lot of fun making the website for SimRugby looks as Web 1.0 as possible. There are a lot of terrible touches that only a true geek would appreciate - the ComicSans typeface, the shading. I think that it became an odd kind of labour of love. You have to try different approaches to categories which seem low interest or low involvement. Otherwise there's nothing for people to talk about, nothing for them to participate in and nothing that keeps the conversation going. "I'm looking for a person to come in house to innocent as our media and communications expert. It is a role that is both wide and deep - it encompasses both being manager of our existing 'house media' channels ie managing our in-house PR resource, our digital platforms and team and our healthcare professional communications, and also being the person working with our media agency and brand managers to determine the best use of our media money - working out what we should be spending on what and how, covering everything from emerging media to old school telly and everything in between." It's a big job that I think will need a big character. I think it's a neat way of bringing this proposition to life. The story behind the ad is quite interesting - the magician in the ad is a Londoner called Brendan Patricks. He was trained by street magician Dynamo. Over a decade ago Fast Company published a seminal article, A Brand Called You. In it they talked about the importance of personal-branding: "We are CEOs of our own companies: Me Inc. To be in business today, our most important job is to be head marketer for the brand called You." Think about your personal-brand in the same way that a marketeer at P&G thinks about a brand, it advised, "When you look at your brand's assets, what can you add to boost your power and felt presence? Would you be better off with a simple line extension -- taking on a project that adds incrementally to your existing base of skills and accomplishments? Is it time to move overseas for a couple of years, venturing outside your comfort zone, tackling something new and completely different?" I have often talked to juniors trying to start out in the advertising industry about really understanding their "brand" and what makes them different and interesting compared to other graduates, Fast Company say:"Start by writing your own mission statement, to guide you as CEO of Me Inc. What turns you on? Learning something new? Gaining recognition for your skills as a technical wizard? Shepherding new ideas from concept to market? What's your personal definition of success? Money? Power? Fame? Or doing what you love?" Sometimes it goes quite OTT and more than a little cheesy, but it was actually smart stuff and well ahead of its time. So if it's all about a "brand called You," I have a question about job titles. At the moment mine is Head of Digital Strategy but it doesn't really reflect what I do. While I do do "digital" planning, I also do "planning" planning. 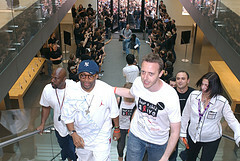 I'm the brand planner on London 2012, on the School Food Trust and lots of other bits of new business. Should I bother change my job title? Does it even matter what people are called in this day and age? What about, Head of (digital) Strategy? But to be honest, to any of you reading this I am genuinely interested in your opinion! 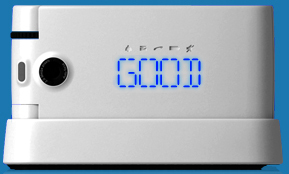 We released this at the end of last week. Third in the medal table!?! That's not meant to happen to Team GB. Suddenly the mood seems to have changed, with people really getting behind London 2012. We're not that good at celebrating things in this country, but this strikes me as something that we really ought to make a song and dance about. Brand marriage made in heaven in my humble opinion. Ally Capellino bags rock - beautiful, incredibly well-made and get better looking with age. These are made just for Macs. "One tall soy milk sugar free vanilla latte no foam to go please"
I think that Chop'd could be the new Innocent. 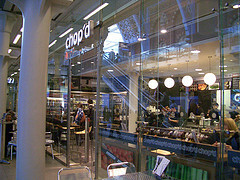 Both Chop'd and Innocent have really understood the current desire to have really good fresh food fast. Busy urban professionals want stuff that tastes amazing, but is also healthy. They are looking for companies with clear ethics but one that doesn't feel too worthy. When Innocent started back in 1999 Richard, Adam and Jon always talked about the way in which they were helping people to be a bit healthier, in a small and manageable way on a daily basis. Chop'd is doing a similar thing - like providing free filtered water ( "refill not landfill"), tasty superfoods and a open and transparent approach to marketing. I had one question for them. For all their good "green" words, I kept on seeing people throw all their rubbish into one bin and I wondered what their recycling strategy was, was a Chop'd person physically going thru all the rubbish? So I emailed them and asked them. What were you doing up at St Pancras? You guys work out of Westminster, no? Glad you like the muesli. My mum brought me up on it. It's really good energy food: fast fruit sugars to pick you up then slow release oats to see you through to lunch. Maybe try our porridge next time. Its equally different, and in summer is great with yoghurt and raspberries, mmmmm. We are currently transitioning from PET (Polyethylene terephthalate) to rPET (recycled PET) packaging. All our salad bowls are now rPET. We hope our cups and bottles and cutlery soon will be too. 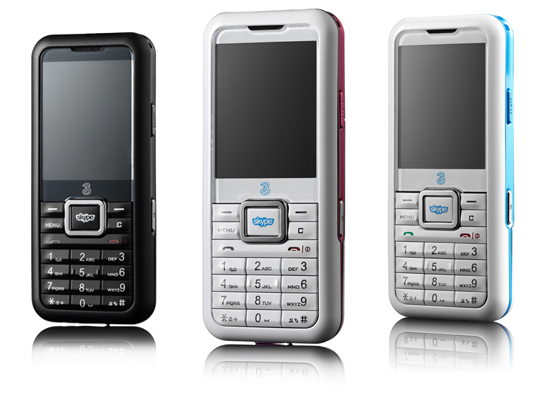 We are also hoping that by 2009 we can 'close the recycling loop'. Our manufacturers and suppliers are currently working on a plan to collect used bowls and other disposables (at the same time as delivering clean ones), to melt down and turn back into clean ones. In the meantime, we sort our instore waste, as you will hopefully have noticed at St Pancras, which the landlords then recycle accordingly. It's just a real shame so many of our customers ignore the sorting signs and chuck any old waste in any old hole. We'll get them there in time, don't worry! I don't know if you'd be interested in occasional lunch deliveries to VCCP, eg for internal meetings, but I know our Curzon Street team already enjoy cycling round St James Park and delivering to another couple of Westminster firms from time to time. Thanks again for your feedback and enquiry. Please keep it coming. Always nice to chat with customers, even if it is by email and not over a coffee! It was a great email to receive. Really personal, really engaged and really informative. Exactly the kind of honest answer that I was looking for. I guess that the challenge will be to keep up that kind of content and contact as and when they grow bigger. Anyway, the food is incredibly tasty. Give it a go if you are close to Canary Wharf/Curzon Street/Spitalfields or St Pancras. Thanks to Educated Community on Flickr for the images. Just Juice - why would you say this? I am aware that this whole "why would you say this???" is starting to become a regular feature on this blog, but I seriously am interested. Now I don't know very much about juce (Innocent Dan, maybe you can help me out here? 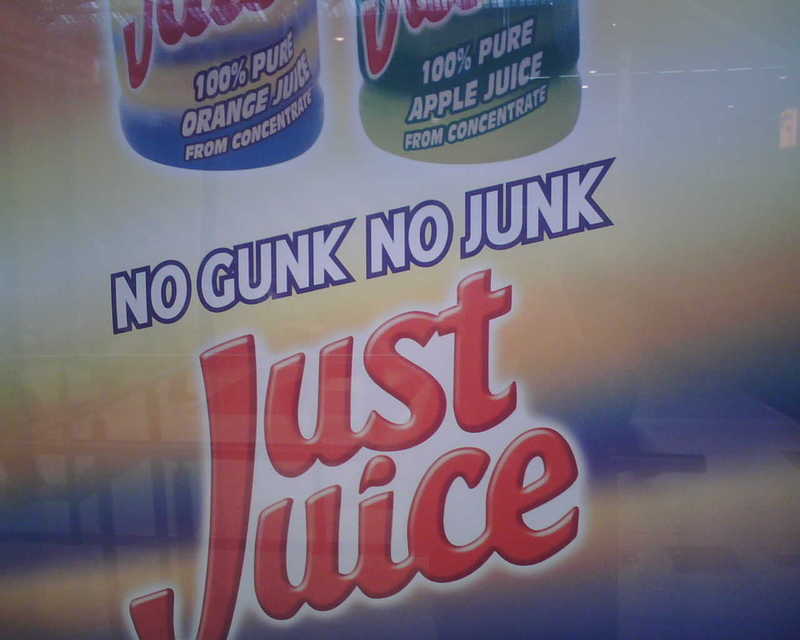 ), but if you say things like No Gunk, No Junk, and then say From Concentrate, doesn't that simply contradict yourself, or actually is concentrate ok? What do Tesco and Miramax have in common? I was talking to some smart folks yesterday who used to work at Dunnhumby on the enormous Tesco CRM account. We were chatting about Tesco and I asked them if Tesco stood for anything. I assumed it was would the "something"-Company and was interested what the "something" was. Apparently not. According to them the company was named after Jack Cohen's mum, Tessa. Reminded me of a story that I heard once about the Weinstein brothers, Bob and Harvey. They named their movie company Miramax after Miriam and Max, their mum and dad. Apparently when the company was in deep financial trouble and the rumour was that they were about to sell, the one thing that they cared about was keeping the Miramax name under their control. Johnny Vulkan constantly impresses and inspires me and I am really proud to count him as a friend. But he also hugely raised the profile of (and I hope money for) Keep A Child Alive thanks to the fact that he was auctioning off the iPhone on eBay. I think that it's just brilliant: Johnny gets to be one of the first people in the world to own an iPhone and become a minor, temporary celebrity in the process and meet loads of interesting people; Keep a Child Alive gets enormous amounts of hugely valuable free publicity (and money) and Anomaly who were smart enough to give Johnny a week off work gets a lot of kudos as do their clients (see the logos on JV's t-shirt and his Jawbone ear-piece) It does more for the reputation of Anomaly as a smart, creative and principled agency that any advertisement that they could have developed and run. Like the Fairtrade sign that I blogged about, this sign mystified me. Our local high street in East Dulwich is fantastic - full of useful local shops, a proper cheesemonger, a fishmonger, a great organic butcher, old fashioned DIY stores, fruit and veg shops. 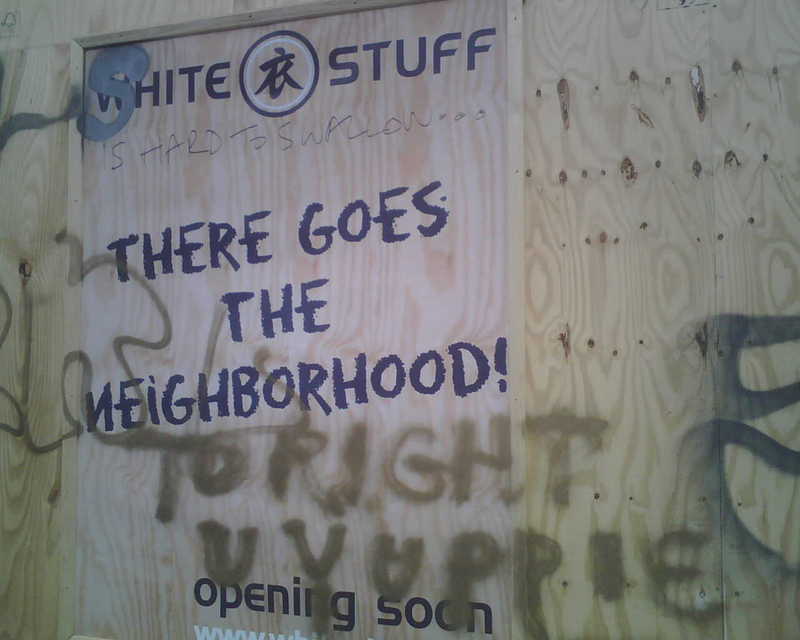 Then along comes White Stuff, a store that no-one wants, and sets up shop. There have been huge protests against them, it's totally out of keeping with the area and no-one wants them. The sign that they put up on the outside of their new store says "There Goes The Neighbourhood." I agree. So obviously do the graffiti artists. So do all the people in the East Dulwich forum. So why would they write this up outside their store? Wolff Olins has come out of this all really badly I feel - their website says nothing about the issue, apart from a Press Release written before all the controversy began. They are not talking to the press, they are not saying a word. Given that they claim to be "the world's most influential brand business" (BTW, was there a competition that I missed which Wolff Olins won giving them the right to claim this?? ), why aren't they doing a better job of managing their own brand? Maybe the best thing about all of this public anger and dislike of the 2012 logo is that it is getting people talking and thinking about design and logos, which can't really be a bad thing I guess. Does anyone like the logo? The announcement last week that Innocent were launching a trial of their kids smoothies in McDonald's seems to have provoked moral outrage. Comments on their blog are for the most part vehemently against the move: "if you jump into bed with the enemy, you're going to get screwed', "either you are stupid or you have sold out big time', "You are tarnishing what you stand for as a brand by associating yourself with a brand that stands for obesity and exploitation. Shame on you." This is a fascinating brand story for a number of reasons. Firstly in this era of Radical Transparency, the fact that Innocent are blogging about this and getting into a discussion with their consumers is admirable. It's interesting to see the way in which this debate is moving online - and there is a genuine sense of a debate taking place, with both sides of the argument expressing their opinions lucidly. In a post about the move, Richard one of the co-founders says that they talked to Innocent drinkers who supported the trial, however to be truly Radically Transparent maybe this debate taken place before the trial started rather than after the announcement was made. The second reason why I think that this is such an important story is to do with environmental ethics. Richard coined the phrase Fast Moving Sustainable Goods to describe the Innocent business model, "we're not perfect but we're trying to do the right thing." Given the fact that a large proportion of the UK kid population do eat at McDonald's, is Innocent simply living up to their FMSG philosophy? If kids are there anyway, surely they should be allowed the choice between ordering a Coke or something like an Innocent Smoothie? Innocent have never said that are a charity, they are in business to make smoothies and to make money. Isn't this just another way of opening up their market and doing a bit of good to UK kids? Finally I wonder if there is an element of Middle Class snobbery occurring? Innocent being the ultimate warm and friendly, Middle Class brand and McDonald's being the supposed antithesis. Kind of a double standard - after all it's fine for Innocent Smoothies to be stocked in Shell petrol stations, Tescos or Starbucks. It's tricky. If I am honest I do worry that this could have a negative impact on an incredibly popular brand who have in the past said that they were against "the dubious tactics of Enron-style conglomerates." But I admire Innocent for trying (and let's remember it is just a trial) this. It's a great example of Radical Transparency in action. UPDATE: Email from Richard Reid, co-founder, received on Monday 7th. Yes, it was a bit of a tough decision, in that we knew we would get a bit of a kicking from some of our drinkers, but when a company slated for selling unhealthy food asks to sell food that is good for people it seemed more irresponsible of us to say no than yes, even though I knew to some it would come across as the antithesis of innocent. When it comes down to it, we've got to where we are today by doing what we think is right, rather than by doing what we think sounds right, if you know what I mean. And this decision was no different. rainforest, and if McD's wanted to sell healthy food we should definitely engage with them. A surprising input, and one which was important for us. Over time we'll find out whether going in was the right decision or not, but irrespective of how it turns out I'll know we made the decision for the right reasons. Plus we might now get some free cheeseburgers, which was the main factor for going for the trial. I think that it's a really smart piece of creative thinking. As consumers we are all starting to increasingly care about the provenance of our food. One of the many reasons I believe that farmers markets are so huge at the moment, we love the idea that we can speak to the farmer who grows the carrots, makes the jams, juices the apples...But then you get to the tricky issue of food that we cannot grow in the UK, like bananas. Once we get over the tricky issue of the carbon footprint that results from the air-freighting of fruit and veg like this, I still think that educated consumers are still looking for "the story behind..." In the same way that I want to know that there is a real story behind the food I buy from Riverford Farm (see Urban Greenies post), I want to know the back story of other food that I buy. I want to know that the power of my pound has been used to good effect. Each banana that Dole sell have a sticker on it. That sticker has a number on it which indicates which farm that specific banana came from. When you go to Dole Organic and type in the code, you learn more about the farm and the people who work there, you can also see the farm on Google Earth. I wonder if you could do the same thing with bar codes that tell "the story behind..." You could scan them using a smart phone and learn more about the working conditions and the people who created the product. "Our organic farm in Ecuador was established on land formerly used as pasture without any agrochemical use history. Manabí Province, the region where the farm is located has the ideal climate for cultivating organic bananas: warm and dry, but with sufficient water supply year-round. The farm created 120 new jobs, 40% women, during a time when the region was heavily affected by the El Niño phenomenon and an economic crisis in Ecuador. All farm workers come from the immediate vicinity of the farm and the project has had a very positive social and economic effect on the community"
I have had two days of conferences - speaking at the Future Marketing Summit yesterday on a panel hosted by the brilliantly didactic Richard Huntingdon, along with a former Ogilvy buddy/mentor Rory Sutherland (who has a lovely blog worth checking out, especially for his most recent Sorrell posting), the celebrated Steve Henry and P&G bright light David Grebert. 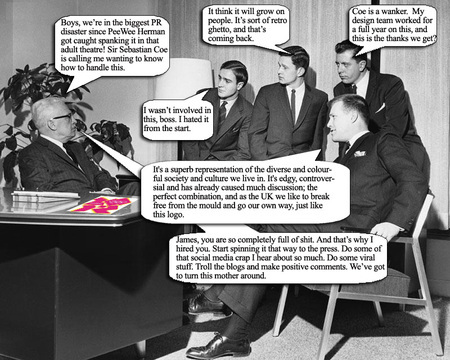 We were discussing the impact that technology has for brands. You can see Richard's presentation here. Not sure that I totally agreed with Steve's point of view that the ad agencies need to be much braver and experiment much more with new digital technologies. While I'd agree that many ad agencies are not always risk-taking imagination leapers, I happen to believe that we at agencies should be proposing new technology experiments when we can clearly articulate to ourselves and to the client, what exactly the value to the consumer would be of us doing it and how it is on brand. Not just new technology for the sake of being first to do something, unless of course that it what your brand is all about but most of them aren't. Then today I was an attendee at the Guardian Changing Media Conference. So what did I learn at the conferences and what can I share? In a digitalized/digitalizing world, Brands need to "Ask not what your country consumer can do for you. Ask what you can do for your country consumer." Seriously though, I got some great food for thought on both days. 5. Alan Rusbridger talks a good game, but does terrible powerpoint slides. Only 3 people out of the entire day choose to do anything in powerpoint at all - the rest just spoke. And spoke brilliantly. Why did he and why do I still feel the need for powerpoint, even if it is mainly visual and not just bullet point after bullet point of text? Oh and I met someone else who has also has a Blog Card to give out to people instead of an official Work Card. His cards were cool Flickr ones though. Good to meet you Dan and your blog is brilliant, Fabric of Folly. If found, please do NOT return my keys! "If found, please do not return. My Next Generation Nissan Altima has Intelligent Key with Push Button Ignition and I no longer need these." I really liked the creative idea behind this Nissan campaign from the States. 20,000 of these keys will be "lost" in cities across America over the coming weeks. Of course Nissan Altima owners don't care if they lose their car keys, the new Nissan Altima has the technology to allow owners to start up their car by pressing a button rather than using a key. 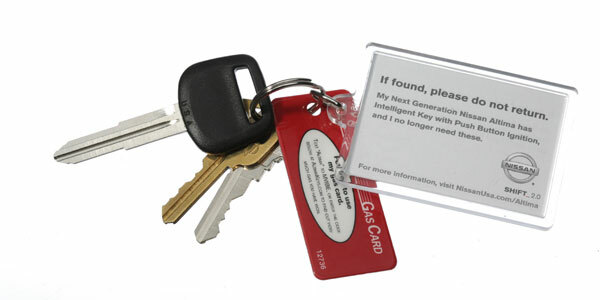 The other Gas Tag on the key fob offers finders a chance to enter into a sweepstake by texting into a shortcode or going online. It's a simple and imaginative idea, but I'm not sure how much impact only 20,000 keys will really have. If I were the Altima Brand Manager I think that I might have put a bit more faith into a smart idea and launched with more than 20,000. The wonderfully named Where's The Sausage blog points out a new addition to the Innocent site. 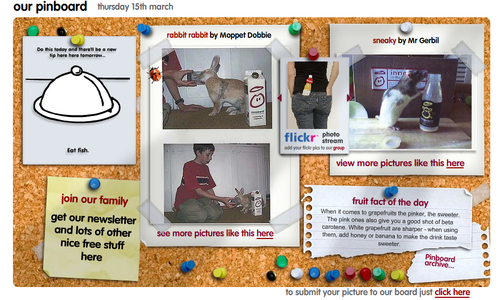 The innocent pinboard links back to Flickr user groups, dynamically updating innocent images. It's a lovely use of technology and a smart way to harness user generated content that otherwise may well have sat on Flickr without too many people looking at it. It also keeps the Innocent site constantly fresh and new. Brilliant.